Well, surprisingly she was absolutely right! I've used it with each of my 3 pregnancies and can now vouch for it's effectiveness (and am hoping the track record continues...). At one point during my second pregnancy I noticed stretch marks forming in an area where shea butter hadn't been applied. I freaked out and started covering it with the shea butter and after a short period of time the marks faded away completely. At this point I was thinking this greasy goodness was pretty much da-bomb. Added bonus: having my husband apply the shea butter not only cured me, but it cured his eczema on his hands as well. 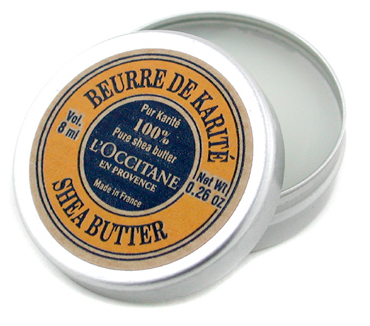 Apparently shea butter is useful for all sorts of hard-to-treat skin maladies and conditions including minor burns (you can read more about it's uses here and here). Also, if you experience extremely dry hands during the winter, try applying shea butter to your hands and then cover them with thin, white cotton gloves while you sleep. 2. L'Occitane does sell a balm that is supposedly made for stretch marks, but it doesn't work sadly. Although it does contain shea butter, it isn't enough to keep the stretch marks away. Going 100% with the shea butter is apparently the only way to go. 3. Today the L'Occitane website shows it is currently sold out of this product, so I'm linking to Amazon instead (however, I'm sure their stores keep it in stock regularly). Sephora also carries it online here. 4. I average about 2.5 tins per pregnancy and begin using it as soon as my belly starts growing (around 4 months for me). Great tip! I am picking up some today during my lunch hour! I admit, I always have to wonder about whether things like this make a genuine difference or if your skin just isn't going to do it anyway. I've come through three pregnancies without any stretch marks, whereas I know other people in my family who've had a horrific time. Unfortunately, there's no way to know without risking the marks, so I guess it's better to be safe than sorry! I should have tried this... four pregnancies ago. I am a stretch mark MESS! I wonder if anything really takes them away AFTER you get them. Thank you so much for this! I am only 11 weeks and freaking out about stretch marks since it runs in my family. I'll be getting some of this very soon! and it's still a fantastic moisturizer! the stuff is like wax!!! do you heat it before applying or are you just stronger than me? My mom gave me the same stuff a couple weeks ago and the only way I can apply it is to heat it up with my hair dryer beforehand... wondering if you do the same? Shea butter did not work for me. I'm in possession of a genetically-predisposed, hash-marked belly. Vive la différence! i've been loving your blog for a while now, so thought i would finally say hello! that lemon curd on your side bar has been taunting me for too long now... i think this is going to be my weekend to finally try it! Sarah M: my husband puts a quarter-size (or nickel perhaps?) portion of shea butter in his hand and then rubs his other hand against it to emulsify it in his hands. The friction warms it up and then he can spread it evenly across my belly. Does that make sense? I also used this during my pregnancy and am, thankfully, stretch mark free! Stretch marks run in my family and my poor mother and grandmother had so many large ones, so I assumed I was doomed as well. Not so with this stuff! I took a bath every night and rubbed it all over my sides and belly upon getting out... Great stuff! I have this, have never been pregnant but I think I will start using it more diligently. Steph, I can't thank you enough for telling me how to pronounce that store! I am your fellow-HG friend. I am at 21 weeks now and starting to feel better. Miracles! Hope you're doing ok. Remember friends: stretch marks are genetic, and even plastic surgeons can't get rid of them completely. But dangit, we can all try! I love a good lotion for sure. I'm pregnant now and one morning my husband says, "you should really make sure you put that cocoa butter all the way on the sides." I'm like "what?!?" and yes, sure enough, there were stretch marks radiatiing from my ribcage toward my belly, all the way around my front. It sort of looked like I got clawed by a tiger with about 40 toes, and each vertical mark was maybe 4 inches long. I went online that same day and bought the Dr Max Powers Stretch Mark Treatment, and applied it fatihfully several times a day to these new stretch marks for at least a week (now I remember only 2-3X/day). Now, about 4 weeks later, there is literally nothing there. I'm choosing to buy this Max Powers Stretch Mark cream since it seems like the best price per ounce, and if I notice new marks, I want to be well-armed to treat them as soon as possible. Dr Max Powers does say their product works best on new marks, and I can certainly vouch for its effectiveness in my case. I've also been continuing to use cocoa butter cream mixed with pure vitamin E oil from the healthfood store ($5 for a small vial). After a friend's doctor warned her not to use Vitamin E oil after varicose vein surgery, as the scars would heal too rapidly, I've been a believer in its powers.